This is a picture of our way cool Advent Calendar. We bought it last year in an effort to start a family tradition. Each day Junia gets to open the corresponding box and get a little present. Sometimes it is a dollar, or a small bath toy, or a piece of candy. Last year I made a list of twenty-five scripture readings to lead us up to Christmas and the birth of Jesus. I did a bit of internet research, trying to figure out what to do this year. 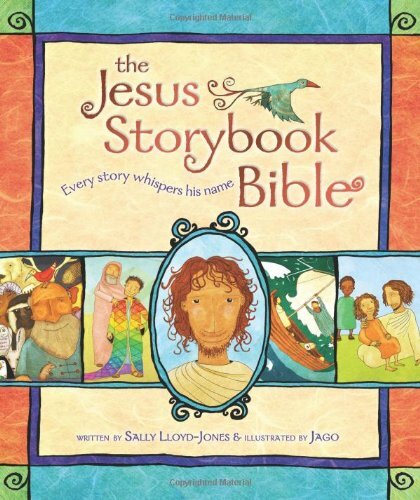 Through this I came across a few blogs that mentioned the Jesus Storybook Bible. It seemed like a pretty neat Bible so we got it. The plan is to read a story a day, first the twenty-one stories from the Old Testament followed by the three from the New Testament centered on the birth of Jesus. I love the holiday season, though it can get hectic at times. My prayer is that this daily family activity will keep Emily and I centered as well as begin to pass on the faith to Junia. Yes, that is a nice rendition of the Bible for children. My kids and I have really been enjoying it. BTW, I found your site via your GoodReads.com book reviews and comments. Your words and level headed responses are not only commendable, but seem to almost draw people (that don’t agree with you) into liking you. Cool.